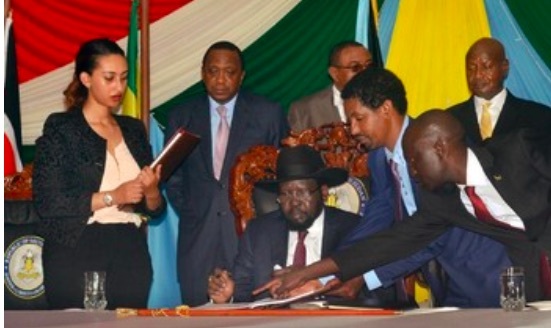 . . FREE FLOW OF INFORMATION . .
A number of civil leaders from across southern Sudan have agreed to work to promote unity, preaching peace and renouncing hate speech to promote peace, in accordance with the peace agreement. Sixty local leaders from Upper Nile, Bahr El Ghazal and Equatorial Regions held a three-day meeting last week in the state of the Yai River to discuss how to implement the peace agreement. In a statement received by Tamazog Radio, the workshop’s Cebu organization said that the aim of the workshop is to strengthen the capacity of the civil leadership and civil society organizations in the peace-building process. Can peace be achieved in South Sudan? Sultan Qwai, representative of the Upper Nile region, told Radio Tamazaj that the workshop added new skills on peace signed by the parties recently. “Let’s come together and start a new life with peace,” he said. Sultan Mtour Abaj, from Bahr al-Ghazal province, pledged to spread peace, peaceful coexistence and unity in order to ease the trauma suffered by the people of southern Sudan during the war. Ayak Deng, from the Abyei region, called on tribal leaders in southern Sudan to work for peaceful coexistence. “Let’s show love and unity among us and fight tribalism and we will not let each other out,” she said. The Minister of Gender and Social Welfare of the State of Yay, Christina Annette, thanked Cebu and its partners for organizing a workshop of local leaders from sultans and activists from all over southern Sudan to discuss peace issues. The minister called for efforts to promote peace-building in conflict-affected rural areas of the state of the River Yai, indicating that the state government is working hard to restore peace and stability so that peace partners can reach rural areas.